A biosafety cabinet (BSC) is one of the most important pieces of equipment in virtually every laboratory that handles low-to-moderate risk biological materials. A BSC maintains a safe environment for personnel, and prevents cross-contamination of the work product in industries such as large healthcare providers, testing facilities, or pharmaceutical manufacturers. Among the many important components determining the effectiveness of a BSC, the most critical is the air filter. 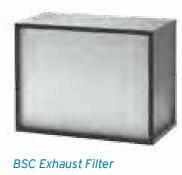 There are two primary types of air filters used in BSCs: HEPA (High Efficiency Particulate Air), and ULPA, (Ultra-Low Particulate Air). Understanding the similarities and differences between HEPA and ULPA aids in selecting the filter which offers the best combination of performance and capability for the specific needs of an organization. A BSC is an enclosed, ventilated, laboratory workspace with a blower fan, airflow plenums and grill patterns, a work area with an opening for a technician’s hands at the front, a transparent front panel to allow sight of the interior, and a control panel to monitor and adjust system functions. There are a variety of standards that define basic performance parameters of a BSC. The most widely used and accepted are NSF/ANSI 49 and Europe Standard EN12469. These biosafety cabinet standards were created by development organizations with all stake holders participating and continue today to maintain and define minimum standards of how a cabinet should operate. Standards allow lab personnel to compare offerings from competing companies and better plan purchases. There are several types of BSCs but all share a common operational principle. Blowers force air through the cabinet to create a work area under negative pressure relative to the surrounding environment. This area of negative pressure isolates materials (product protection) inside the cabinet. A concept from fluid dynamics known as “Bernoulli’s principle” can describe the creation of negative pressure due to the movement of air within a BSC. Bernoulli’s principle states, in part, that an increase in the speed of a fluid occurs simultaneously with a decrease in pressure. In this case, the air inside a BSC acts as a fluid, the velocity of which is increased by means of a blower. As the velocity of the air increases, the pressure of the moving air decreases creating the negative pressure necessary to operate a BSC. 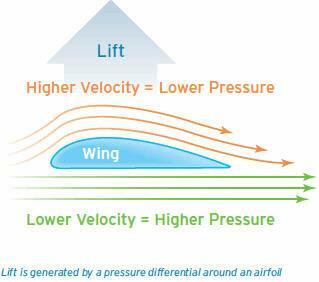 Bernoulli’s principle also describes the creation of lift by an airplane wing. The air flowing over the top of the wing must move a greater distance around the wing in the same amount of time as the air flowing along the bottom moves a shorter distance. This pressure differential creates lift. 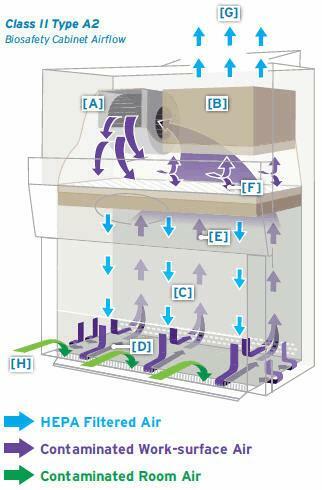 The most widely used type of Class II BSC, the Type A2, uses a blower [A] to circulate air in the cabinet — through a HEPA or ULPA air filter [B], down into and over the work space in the front [C], through to the bottom [D], and up the back [E] of the cabinet to the top again. At that point, some of the air is recirculated [F], with the rest of the air either discharged [G] into the lab or through the facility’s exhaust system. Additional air is pulled through a grill from the lab [H] into the cabinet to make up the discharged portion. The velocity of the air creates negative pressure, preventing air from escaping through the user access opening of the workspace. In addition, the cabinet design creates laminar flow, which means air passes smoothly around object in the work area, including the hands of personnel, minimizing turbulence and the chance of cross-contamination between samples. The operation depends on the design and integrity of the cabinet, the power of the blower, and the air filter. The filter is integral to the safety and protection of personnel and of the materials in the work space. Without the filter, air passing over the work space could pick up contaminants, cycle them through the cabinet, and deposit them on the work product, creating cross-contamination. The filter removes airborne particulate before the air is returned into the work space. Some of the particle types that such a filter traps are bacteria, viruses and spores. However, a HEPA or ULPA filter is gas-permeable, so odors, vapors, or chemicals such as Acetylaminofluorene can remain in filtered air. There are two different types of filters used in BSC designs: HEPA and ULPA. However, there are multiple test standards in use for the two filter types, which can create confusion. The U.S. BSC standard NSF/ANSI 49 applies the Institute of Environment Sciences and Technology’s IEST-RP-CC001 filter standards and classifications for both HEPA and ULPA. The EU’s EN 12469 BSC standard applies European Standard EN1822-1. Each has a different approach to measurement. IEST-RP-CC001 uses photometers and particle counters to test the efficiency with which particles of a particular size are removed from the air stream. EN1822-1 uses particle counters or differential mobility analyzers to determine the removal efficiency of the most penetrating particle size (MPPS), which can change with such factors as filter media fiber size or air flow rate. Which standard a manufacturer uses depends on how the BSC is marketed, whether NSF/ANSI 49, EN 12469, or elsewhere (either standard or other specifications may be used). HEPA filters are widely used in BSCs and also in facilities such as hospitals. HEPA filters remove airborne particulates, allergens, bacteria, and other materials that could cause health problems, or cross-contamination, if allowed to remain airborne. Standard NSF/ANSI 49 specifies the use of type C or J HEPA filters in a BSC. Under testing method IEST-RP-CC001, a type C HEPA filter must remove particles of 0.3 microns in size with an efficiency of at least 99.99 percent. A type J HEPA filter must remove 99.99 percent of particles from 0.1 to 0.2 microns or from 0.2 to 0.3 microns. HEPA filters are capable of removing particles above and below these size ranges but the efficiency will vary from that of the specified particle sizes. EN standard 12469 specifies the use of H14 filters or better. Under testing method EN1822-1, a filter’s efficiency is defined by MPPS (Most Penetrating Particle Size) based on velocity of air flowing through the filter media. The test does not look for a specific size of a particle passing through the filter like IEST but instead defines the filters efficiency based on the percentage of particles penetrating the filter media. Both HEPA and ULPA filters use mats of randomly arranged boron silicate fibers — typically of fiberglass — that range in size from 0.5 microns to 2.0 microns. Unlike a sieve or screen, the filter does not prevent the passage of particles by only offering openings smaller than the size of particles being filtered. If that were the strategy, the holes might quickly fill, requiring more frequent filter replacement. Instead, the filter relies on several physical mechanisms, as well as electrostatic attraction, that cause the particles to become stuck on the fibers inside the filter. Because the air passages through the filter are not blocked, a filter can have a long life span. In a BSC, a HEPA filter life span would typically run between five and 15 years, creating a long mean time between replacements reducing cost. In addition, HEPA filters offer minimum pressure drop and maximum airflow in operation. Air moves easily through them and relatively little power is needed to overcome restrictions. ULPA refers to an air filter using fabrication technology similar to that of a HEPA filter, but with different performance standards. Like HEPA standards, ULPA standards vary in their definitions. Standard NSF/ANSI 49 specifies the use of Type F and K ULPA filters. Under testing method IEST-RP-CC001, a type F ULPA filter and must remove 99.999 percent of contaminants either between 0.1 microns and 0.2 microns or between 0.2 microns and 0.3 microns. A type K ULPA filter must remove 99.995 percent of particles from 0.1 to 0.2 microns or from 0.2 to 0.3 microns. As with HEPA filters, a ULPA filter can remove particles both larger and smaller than the test size. The specification sets a minimum efficiency, which means ULPA filters remove more material from the air than HEPA filters. Under EN1822-1, the minimum MPPS is 0.0025 microns and the necessary efficiency is 99.9995 percent to be classified as a ULPA filter. The increased filtering does come at a price. ULPA filters are typically 35 percent more expensive than HEPA filters. HEPA filters average a 10-year lifespan while ULPA filters typically last between 5 and 8 years. ULPA filters also, on average, allow 20 percent to 50 percent less air through than HEPA filters. To move the same volume of air through a ULPA filter of the same dimensions will take significantly more force than would be necessary with a HEPA filter. A filter with a larger surface area or with greater thickness will increase the amount of air that can pass through, but that can increase the size of the BSC. The distinction between HEPA and ULPA style filters can be unclear given the range of testing methods per BSC standard. For example, a filter that is 99.995 efficient at a most penetrating particle size might be classified as a HEPA H14 under testing method EN1822-1 (EN12469). However, that same filter could also be classified as a Type K ULPA filter if tested using method IEST-RP-C001 (NSF/ASNI 49). In light of this, the most reliable method for choosing a filter type involves the consideration of the intended purpose of the filter. 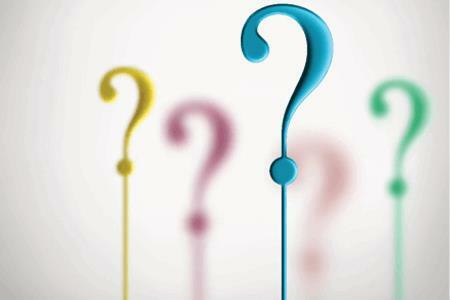 The following four factors are important considerations when choosing a filter. A BSC is designed to work with filters which meet a defined standard, typically IEST-RP-CC001 or EN1822-1. Choose a filter that meets the appropriate standard for the BSC. The primary purpose of a HEPA or ULPA filter is personnel safety and protection of the work product. A ULPA filter will remove particles with greater efficiency than a HEPA filter of the same dimensions. However, the degree of filtration necessary depends on the type of work being conducted in the BSC. For most biomedical applications, HEPA offers more than adequate filter efficiency to protect personnel and prevent work cross-contamination. An ULPA filter will function in a BSC, but the level of filtration efficiency is typically far higher than necessary, providing limited, if any, benefit over the use of a HEPA filter. ULPA filters are more expensive than a HEPA filter of the same dimensions. Additionally, ULPA filters have a shorter service life than HEPA filters, increasing maintenance costs due to more frequent replacement. The difference in amount of air that can pass through a ULPA versus a HEPA filter has significant implications. The operation of a BSC depends on engineering, manufacturing, and operations that permit the level of air flow necessary to maintain the proper amount of negative pressure in the cabinet. A ULPA filter slows the air flow by 20 percent to 50 percent compared to a HEPA filter. To maintain the same air flow and resulting protective measures of the cabinet, one of three things must happen: the filter area must be enlarged, the depth of the filter increased, or the power of the blower increased. Any of these three options increases the cost of the BSC, both in the initial purchase and in operating expenses, either through larger and more expensive filters or from maintenance of a more powerful, and expensive, blower. The choice of whether to install HEPA or ULPA filters in a BSC has short and long-term implications for lab management. HEPA filters meet or exceed the filtration needs for biological work in a BSC. ULPA filters provide no distinct advantage for scientific research and are more commonly employed in the semi-conductor industry. Filter costs will be lower as will the configuration price of the BSC. Less power is required to run a blower when a HEPA filter is in use, lowering energy costs. In theory, since HEPA filters allow more air to pass through the filter media than ULPA filters, a HEPA filter will take longer to reach maximum load resulting in a longer life. Filter replacement costs and blower maintenance expenses will also be lower, leading to a more economical installation.